If you want to take your dynamic remarketing game to the next level, then you’ll need to utilize your feed. The Hotel and Rental Feed Template will help you manage the information displayed on your ads for customers that have visited your site. The Hotel and Rental Feed Template is a great tool to upload all the information you want to include for your hotel or rental-based site and have AdWords target the perfect customers for your product or service. Stop searching for customers, have them flock to you. First, enter your Property ID in column A. This will be a unique set of letters and digits that will specify a particular product or service on your site. This ID will be fluid through your entire site so make sure the ID you assign is unique. The Property Name column will display the name of your hotel/rental property. Next, enter the Final URL. This column is where you will enter the landing URL that customers will be directed to once they click on your hotel and rental feed ad. If you want to add an image with your ad, which is highly recommended, you can easily insert your image URL in column D. AdWords will accept any of the following formats: JPG, JPEG, GIF, or PNG. Column E allows you to enter the Destination name of your rental or hotel property. This will help target customers searching for hotels in the area of your business. Adding extra descriptive words will also help recommendation engines target the perfect customers for your business. You can enter this in the Description column. For your unique product or service, you’ll more than likely need a price to list on your ad. The Price column lets you enter an initial price for your item. Make sure to use the standard currency code, ISO 4217. The Sale price column will work in conjunction with the Price column, allowing you to enter a temporary price reduction for your hotel and rental feed item. You will also use the same currency code here. If you need to group together similar items for your site, then the Category column is the perfect way to do it. As with the example, simply enter a consistent category name that will be used throughout your entire site to connect similar products/services. Another way to improve your customer’s recommendation engine results is through the Contextual keywords column. Here, you can simply enter relevant keywords that are consistently stated throughout the content of your landing page. If you want to include the address of your rental or hotel property, which can be featured in the ad, simply enter it in the Address column. You should also note that AdWords will only accept the same structure represented in the example document. Finally, the Tracking template and Custom Parameter columns are an optional section in which you can either enter a URL you want people to go before going to your landing page or you can create your own custom parameters to include specific features of your hotel and rental feed item. Both of these can only be used with a Final URL though. 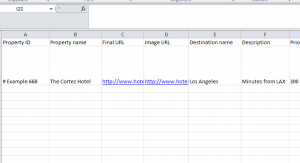 When you finish entering all the information in the Hotel and Rental Feed Template, you will simply upload the document into your AdWords campaign.